I have always assumed that Bali would make for an expensive visit and therefore had not entertained any thought of traveling to that island anytime. So it was a pleasant surprise that I learned I was going to Bali for a national conference with the Indonesian staff of our organization several years back. Things could not have been better. Such a conference meant some work for me but it would also allow me to experience Bali at long last. The notion that Bali was extravagant beyond affordability was effectively shattered that day when I checked into our affordable hotel and during our wanderings around the island. Bali has such a wide range of resorts from budget accommodations to luxurious, high-end resorts ready to cater to anyone. The same goes for food here. There is a wide variety of restaurants and cafes serving both local and international cuisine. We were limited mostly to food served at the hotel but there were several small and inexpensive restaurants serving Indonesian cuisine that I should have sampled. Sunrise at a beach in Bali. Photo courtesy of Joel Dasalla. One of the first places we passed through on the way to our hotel was Kuta Beach, famous for its surfing, nightlife and shopping. 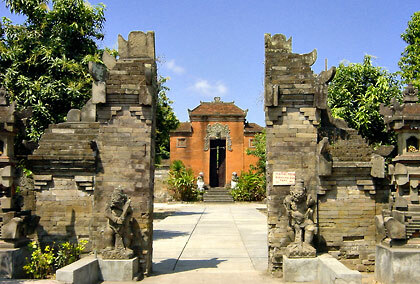 It’s also the most developed place in Bali. During the time of my visit Kuta was recovering from a terrorist car bombing that had killed 202 people but looking around then there was little trace of that tragedy. A memorial dedicated to the victims of the bombing now marks the spot. The temple at Tanah Lot, Tabanan, Bali. Although people all over the world praise Bali’s beaches, I thought there were other more beautiful beaches in Indonesia and the rest of the region. But Bali is more than sun and sand. Most of its people are Hindus and so its culture is unique compared to the rest of Indonesia. This is the island of a thousand temples. 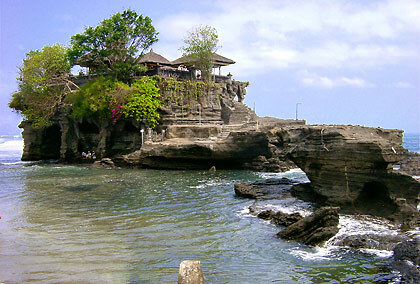 There are nine major temples such as Tanah Lot which is built on a small rocky island in Tabanan. A short strip of land, which becomes submerged during high tide, connects the island and temple to the mainland. There are also hundreds of smaller temples. Each village in Bali has at least 3 of these temples and it seems almost every house has an altar where locals place their daily offerings. Religion and art also come together in these many altars and in the various statues of Hindi gods and goddesses that proliferate in the island. 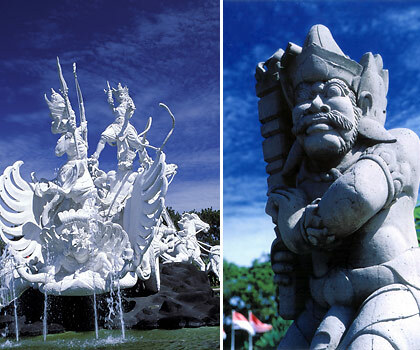 Religion and art come together: these figures betray the dominance of Hinduism in Bali. Photos courtesy of Joel Dasalla. Festivals are celebrated by the Balinese in colorful traditional garb. I was quite fortunate to observe a parade with local townsfolk proudly marching in their traditional dress. I also got to observe some cultural presentations at the hotel featuring Balinese dancers and musicians. The dancers’ movements, particularly that of their hands, made me wonder if the Khmers and Thais got their dance from the Balinese and other Indonesians around the time when most of the latter were predominantly Hindus. Some historians believe that the early Khmers (Cambodians) actually came from Java, thus bringing their art and architecture with them. 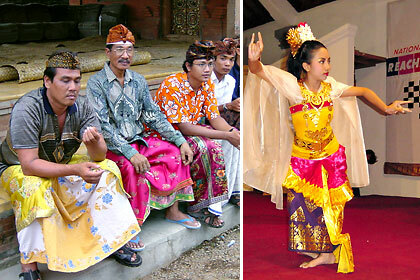 Left: Balinese men in colorful traditional attire; Right: Balinese dancer in our hotel. But back to the beaches. Nusa Dua is famous for its high end resorts although we spent time instead on its clean golden sand shores. 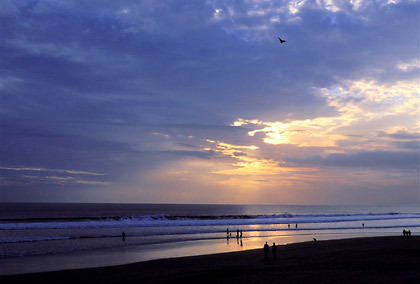 The surf here is pretty strong and the beach is used for surfing during the rainy season. Later we had open-air dinner right at another beach – Jimbaran – where we thoroughly enjoyed grilled seafood and were serenaded by a local band going from table to table and belting out early rock and roll numbers. Rice terraces on a hillside. 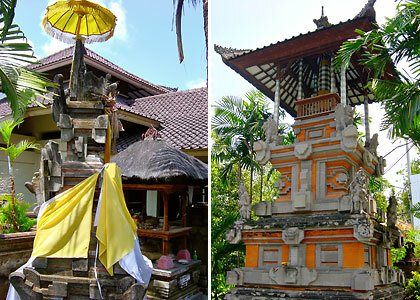 Besides the more familiar beaches and Bali’s Hindu culture, there are many other attractions. 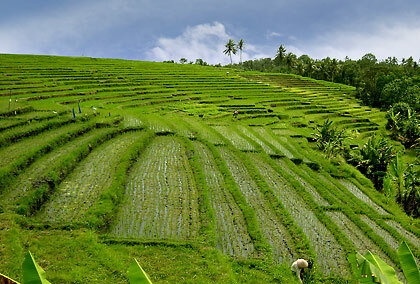 Driving around some parts of the island we came across several rice terraces on low-lying hills. While not of the scale of the Ifugao rice terraces in our home country, Bali’s hillside terraces are beautiful and add to the variety of the island’s landscape. I was somewhat disappointed that we did not make it to Bedugul and its three crater lakes, botanical gardens and the Ulun Danu Temple complex. 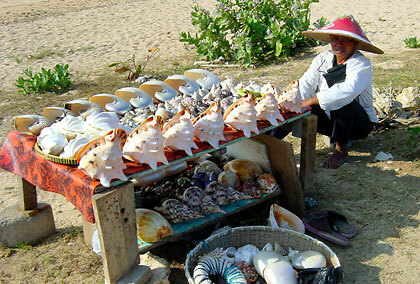 Hawker selling shells at a roadside stall in Nusa Dua. 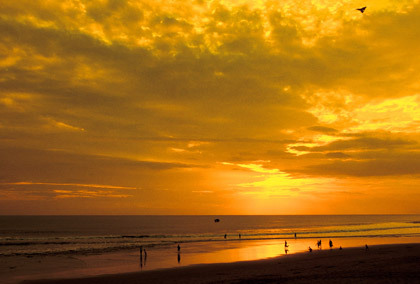 As with any well-known tourist destination shopping is a must in Bali. The reason for the latter was because our Indonesian friends wanted to take advantage of the time to do some shopping, another favorite activity of visitors to Bali. There are numerous shops as one would anticipate in such a well-known tourist destination, ranging from the shopping malls in Denpasar, the capital city, to the street-side stalls in Sanur, Kuta and Nusa Dua. I can’t remember now where we went exactly but it was a whole day of shopping that included some time at Ubud with its artifacts and antiques. Incidentally the latter is known to be a center of arts and dance. Photo courtesy of Joel Dasalla. The setting sun doesn’t signal the end of the fun and revelry here. In many ways, the night life here is much like Boracay’s in the Philippines. While I thoroughly enjoyed dinner at Jimbaran Beach I still prefer quiet evenings more. There is nothing like watching the setting sun’s rays paint the canvas of sky and clouds with hues of yellow, red, orange and blue with the muffled sound of waves accompanying the colorful display – a fitting end to another day in this island paradise.